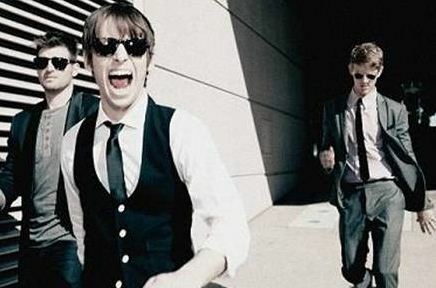 Toronto – Easily one of the most promising bands that are on the verge of a massive breakout, Foster The People is an LA indie pop trio comprised of Mark Foster, Cubbie Fink and Mark Pontius. They recently released a self titled EP that just oozed potential with two glorious a-sides. Houdini, the first track off the record contains inspiring melodies, fun synths and an outrageous gang vocal outro that takes the song to another level. The second track off the EP – Pumped Up Kicks has already been floating around the internet for awhile now and with it’s catchy chorus and lazy summertime bass lines I wouldn’t be surprised if the track gets taken to another level as more and more people tune in. The band will be in Austin to not only promote their EP, but their self titled debut LP Torches which comes out on May 24th. I will definitely be seeing them. Don’t be surprise to see them pull a Temper Trap, another band with an outrageously awesome single that just exploded after a few terrific turns in Austin last year. SXSW Preview: Dale Earnhardt Jr. Jr.
Toronto – First of all, you know your band is doing something positive when someone does an oil portrait of you. 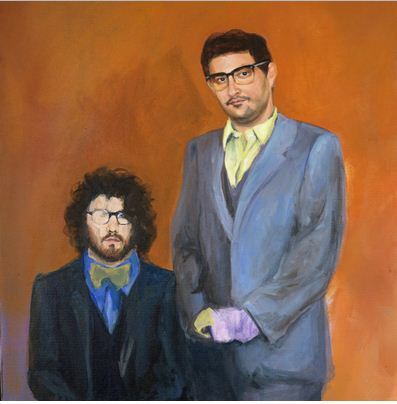 Dale Earnhardt Jr Jr is a two man project composed of Joshua Epstein and Daniel Zott. I had been receiving emails about the buzz that the band is generating since last June but because their band name reminded me of Dale Earnhardt, which reminded me of Nascar, I promptly ignored it. How stupid is that? It was quite stupid. I rediscovered (or discovered?) this band whilst listening to a SXSW compilation. Amongst all the mediocre music you would expect from a compilation of a thousand or so songs, I was delighted to hear a catchy melodic track named Vocal Chords that evoked memories of jogging along the beach, buying a mango milkshake and eating an avocado sandwich. Of course, I have never done this before, but I can live vicariously through someone who has. Toronto – With the recent popularity of Phoenix and some valerie bands, it would only seem natural for more French electro pop acts to come out of the woodworks. One of those bands that is enjoying a bit of a renaissance is Tahiti 80. If that name sounds familiar to you, that’s because Tahiti 80 was around when French electro pop bands first started invading the shores of America in early 2000s. Their single Heartbeat made them many fans in that era, as the effortless playful summer tones of that song was a nice contrast to all the other music that was popular at the time. You have probably heard this song. If not the original, then the popular Cornelius remix that exists. Since that time, the band has released four more albums but were unable to obtain similar success on the rugged shores of America. The new infusion of French talent in recent years has once again opened the doors for Tahiti 80 to try to reclaim what once was theirs, if for only a fleeting moment. The Past, The Present, and The Possible is Tahiti 80’s new album. Their sixth effort, the album is filled with electro laden, hooked fill indie pop tracks that brings in a nice warm current to the winter time air. I don’t know what it is about French bands, maybe it’s the wine, maybe it’s the cuisine. All their music sounds so effortless and fun. Tahiti 80s new album is no exception. While it’s easy to compare this band to current French pop kings Phoenix, one has to remember that these bands have basically been around for the same amount of time. Luckily for us, Tahiti 80 is touring North America this year and you can make these comparisons yourself! They have other dates. None of which is Toronto, sadly. Since I’m so nice I called up all these clubs and got the set times for you. Darlin’ (Adam & Eve Song) from Tahiti 80 on Vimeo. Toronto – Watching the The Wedge last night, I was fully introduced to Austra, a new band featuring talented singer Katie Stelmanis. The song played was called Beat & The Pulse. The song was very appropriately named, as it had a ridiculously dirty beat that instantly captured my attention. Combined with Katie’s tremendous, sometimes haunting vocal work, this is one mesmerizing tune. The video captured the essense of the song nicely, coming across as a mix of a risqué American Apparel commercial (pointed out by Melody from Singing Lamb) and a scene from those illegal night clubs in Eastern Europe. You can watch the video here. Austra’s debut album Feel It Break comes out May 17th on Paper Bag Records in Canada and on Domino Records everywhere else. Their official showcase at SXSW will be March 17th, Emo’s Main Room, at 9:00 PM, although I suspect they’ll be playing 5 or 6 other shows like every band who makes it down there.